Home > Comet Clutches and Parts > Comet 212225A. 5/8" Jackshaft for TAV/TAV2 Torque Converter > Comet 011461A Jackshaft. 12" L x 5/8" (.625") Dia. 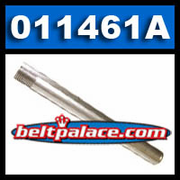 - OEM Comet 011461A. Comet 011461A Jackshaft. 12" L x 5/8" Dia. Comet 011461A Jackshaft (No threads). 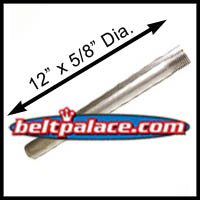 12" L x 5/8" (.625") Dia., 3/16" Keyway - OEM Comet 011461-A. Genuine Comet Industries Part 011461-A. Made in USA! Comet 212225A. 6-3/8" L x 5/8" Jackshaft for Comet Industries TAV/TAV2 Torque Converter (threaded end). Replaces Kenbar 300-022.